Fifteen million. Many things in this world are considered icons. Few things in this world live up to their iconic status. The Ford Model T is one of those rare objects that surpass its iconic status. It is impossible to overstate the significance of this plucky little black car. Henry Ford an unapologetic and crude visionary designed it. His creation, the Ford Model T, was the best selling car for many years. This car made the horse and buggy obsolete, it made cars attainable for everyone, it made cross-country vacations possible, it created countless memories, and it put the world to work. Today the Model T is remembered as an exceptionally slow automobile that is overcomplicated and out of date, yet nostalgia and the character of the car make the Model T something that is still universally loved by all. The Model T was not about style. In fact the Model T was so utilitarian that after several years of production Henry Ford decided to make the car only in one color, black. Black dried the quickest and was the cheapest to produce. Yet there is an undeniable beauty to the Ford Model T that cannot be ignored. This 1917 Model T Touring is not the finest example of the breed. If this was a brass era Model T it would have scored at least a 7. One of the most interesting design aspects of the Model T is the driver side door. The door doesn’t actually exist on this car. The mock door is there for stylistic purposes to make the car look symmetrical on both sides. The designers didn’t get a lot of say when they designed the T but at least they got to make the car look symmetrical. The Model T has a few unique interior amenities that make the car relatively luxurious. For example it can seat multiple passengers four to five people making it as practical as a midsize sedan. Also this car has something Cadillacs didn’t even have during the malaise era wood. Yes sir this $295 car had a wood steering wheel and on certain models a wood dash. Making it as luxurious and beautiful on the inside as a Rolls Royce. Okay so maybe the wood was probably used from a shipping crate and maybe it looks like a four-year-old put it together but nevertheless a cheep and chips Model T has wood and a 70s Cadillac does not. Overall the 1917 Touring was quite spacious on the inside. Everything fell readily to hand and it was a well thought out interior. The simplicity of the design was good for several reasons. It was easy top fix, it allowed acceptable room to accommodate a small crowd, and finally the design could withstand the tough conditions of early motoring. For those reasons the interior earns a six. The Model T was powered by a 177 cubic inch (2.9L) straight four. The Model T was an eager little car but unfortunately the car ran out of breath at only 45mph. Enough about the facts though, the real question is how does the car feel when it accelerates? The Model T is a very pleasant accelerator when the driver asks for more speed. It does not accelerate like a modern car though, the driver must use a hand throttle located on the steering wheel and move it from a three o’clock to a six o’clock to gain more speed. There isn’t a since of urgency but instead a sense movement as old T car gains speed. It is far more visceral to drive than a faster midsize sedan from today. So even though the Model T is going slower the sounds, the smells, the pull in your gut as you propel the car forward make the driver feel like they are accelerating at a rapid pace. That is why the car earns a five. Also try to imagine going 45 with no roads and wimpy brakes. In its day the Model T was quite fast. The Model T does stop but only after you have begged and pleaded with the car. I had to convince the 1917 Touring that I would give it my first-born and only then did the old girl decide she would stop. The problem with the model T is the brake peddle operates a transmission brake. The actual brakes on the car are only for emergency and the same lever that operates the brakes also operate what gear the car is in. When using actual brakes on the car the driver is essentially placing the car in park. The best way to slow down a T is to hit a cow. Unfortunately PETA would not approve of this method and since the Model T does not have seat belts it could also result in the death of the operator. The second best way to slow down a T is a combination of the transmission brake with the hand throttle. But the distance it takes to actually stop the car is horrific. That is why the Tin Lizzy only scores a two. The ride is best compared to the ride on a lawn mower. Yes it is smooth and floats along on a smooth road but that’s about it. A Model T is not a car for bumpy roads or rough pavement. The car was designed to get a driver from point A to point B. It was not designed to get them there in comfort. The Model T was a rugged and dependable car that might break your back but you certainly could not break it. The seats were not supportive but more comfortable than a saddle or bench and the upholstery was decent. The Model T earned a four mainly for one reason, compared to a horse, which was the alternative mode of transportation at the time the Model T was far more comfortable. Well the car went left and then it went right. To get the 1917 to turn left or right though was like winning an arm wrestling match with a gorilla. You might be able to do it but afterwards you’ll be exhausted and your arms with be throbbing. It isn’t something I would recommend doing on a daily basis. What is truly amazing is how many little kids used to operate these cars. It took a certain amount of strength to turn the wheel. Thankfully though the rough turning could be remedied by fitting a larger wheel. More leverage made the T easier to turn. Even if it was difficult to make the T turn left and right there is no doubt the weight of the steering was satisfying. The T’s steering had a mechanical feel that I have never before experienced driving anything else. The wooden wheel might have been made of cheap wood but after leaving the T I am convinced every steering wheel should be made of wood. This car earned a three because of the small size of wheel. If the wheel were larger it might have scored higher because it would have been easier to turn. People have often been told the Model T is a complicated car to drive and the gearbox was needlessly over complicated. The planetary gearbox in the T is something that shouldn’t really work on paper yet Henry Ford somehow made it possible. The transmission has two gears low and high. Those two gears were more than acceptable for this car. To select first gear a lever on the left side of the driver roughly a foot long must be moved from 10 o’clock to 12 o’clock. Once at 12 the car is in neutral to engage first one must press down on the clutch pedal. Holding the clutch pedal the entire time the driver in is first to speed up and down the driver must operate the hand throttle. The clutch peddle on the T was extremely heavy however it wasn’t a major concern because after a short time the driver could engage second gear. To engage second gear the driver would move the lever on the left from 12 o’clock to 2 o’clock. As soon as that is accomplished all the pressure your foot is using to keep the clutch down must be removed. I found the best way to do this was to simply remove your foot from the pedal. After your foot is removed all the driver has to do is set the desired speed with the hand throttle. I found the transmission to be the most exciting part about the Model T. It was incredibly involving and always left a smile on my face. The best part though was once you engaged second gear it was like the Model T had a primitive cruise control. No feet on any pedals and simply cursing down the road. The only reason the Model T did not score a ten was because when you placed the lever in neutral there was no mechanical feedback whatsoever. A small grip though for an otherwise outstanding gearbox. Well I am going to let you in on a little secret here. The Ford Model T was produced before the in car radio was invented. Therefore I can’t really knock any points off of it for not having a Beats Audio system like your neighbors fancy Chrysler 300. Instead the only audio system the driver is graced with is the classic sound of a Ford straight four. And it sounds wonderful. It takes the driver back to an era when cars were a bit slower, life was a little less complicated, and there weren’t stupid plastic covers over every engine. The sound of the engine is something that really can’t be reproduced by cars today and the Model T is better for it. Perhaps louder than the classic straight four was the gearbox. The high-pitched whine of the gears again is something that can’t be reproduced today. Some may find it annoying others like myself hear this and smile knowing that the cars of yesterday have just a little bit more character because of their unique gearboxes. I can’t imagine anyone ever tiring from hearing a Model T. Cars back then were still so new and exciting that it still must have been magical to hear a car start up. For all those reasons this car receives an eight out of ten for audio. The Model T had quite a bit of toys when it was produced headlights, enclosed interiors, an engine, and eventually an electric starter. Today those all come as standard but at the time when your neighbor still had a horse and buggy these “toys” were massive leaps forward. The best toy though is the primitive cruise control. No it was not meant to be a cruise control but essentially that is exactly what second gear on a Model T was. Conventional cruise controls still wouldn’t be along for decades and Ford was doing it in 1908. So when you put everything into context giving a Model T a six for the toy department is actually reasonable. Great running clean car. | eBay! 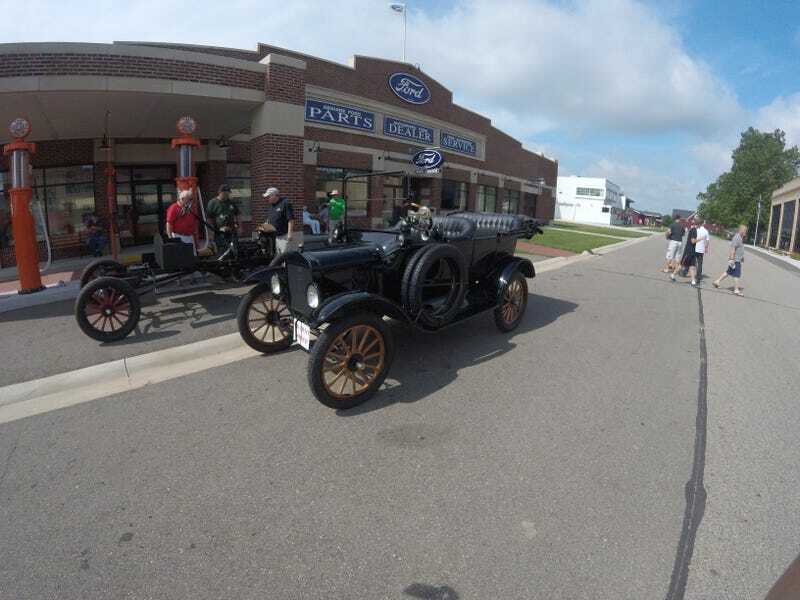 The Ford Model T is a car that had been highly modified and changed over the years by many people. Originals can still be found though without looking too hard at all. A good original can set you back anywhere from $10,000 to $40,000. $10,000 can buy a cheap sedan and $40,000 can buy a brass era T that is down right beautiful. You are compromising quite a bit thought when you buy a T. It really can never be a daily driver, it gets 10/12 miles per gallon, and for the price you pay there are faster and more comfortable options. That being said the Model T is a special car and it is worthy of the price. If you buy a Model T you are buying an icon. The car is also cheap to insure and to maintain. It is a very affordable way to get into the collector car hobby and having something that you can be proud of at a local car show.